Studying Modernism and the context in which it emerged has a strange effect on the body and mind. I’m starting to curse a lot. And audible sighs can be heard from my direction on the hour, every hour. I’ve decided that I don’t ‘like’ Modernism. That doesn’t mean I don’t like Modern design but it does mean that I’m not a fan of the quite extreme forms that it produced from the first couple of decades of the 20th Century. I do however dig its simplicity and minimal aesthetic in general. And I can see how a lot of today’s design still takes its inspiration from the overall design ethos of the Modernist ‘movement’. Take the interior of The MAC in Belfast for example (for those of you who are clued up on the design attributes of Modernism, you’ll have observed what I’ve done here in my presentation of this example…for those of you who aren’t clued up on Modernism you’ll have absolutely no idea what relevance a black grid and a few black squares has and to be honest up until a week ago I wouldn’t have had a clue either). The above illustration is actually quite thought provoking. I have been in The MAC (located in Belfast) on a number of occasions and whilst I noticed the modern and industrial inspired design of the interior (it utilises a lot of concrete and metal), I didn’t realise that it may have taken inspiration from one of the founding fathers of Modernism. 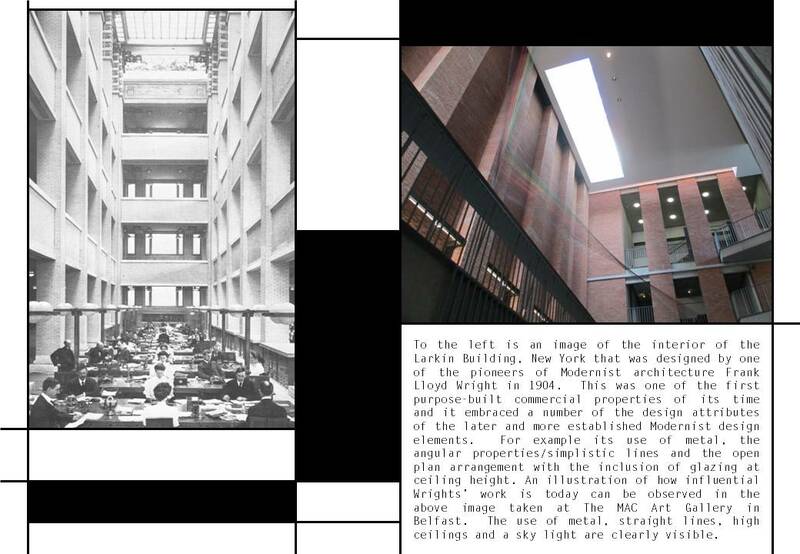 How unfortunate that most people who grace the concrete floors of The MAC might never make this connection; just like I didn’t prior to studying the subject of Modernism and indeed the work of Frank Lloyd Wright. For the record, I actually like the Frank Lloyd Wright interior in the above picture – unfortunately this building was demolished in 1950. 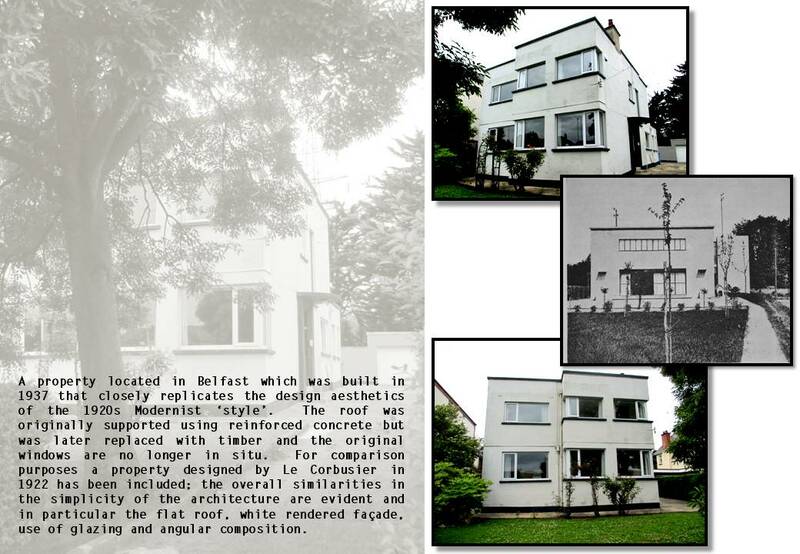 Then we have the Modernist property (again, in Belfast) that I discussed in my previous post. I always had an idea that it took inspiration from a particular period but never really gave it much thought until I researched the design elements that characterised Modernist architecture. Once again, people probably saunter past this property criticising and questioning its existence not understanding that whilst it isn’t the most graceful design in the world; it does represent a specific design ‘movement’ in history that continues to inspire and infiltrate the world of design today. And that’s extremely saddening (not the ‘inspire and infiltrate’ part; I’m referring to the lack of understanding). This is an illustration that I created (it’s official; Photoshop rocks) to display a number of paintings in the early decades of the 20th Century that kinda celebrated cogs ‘n’ stuff. Ok, I’m being slightly flippant. 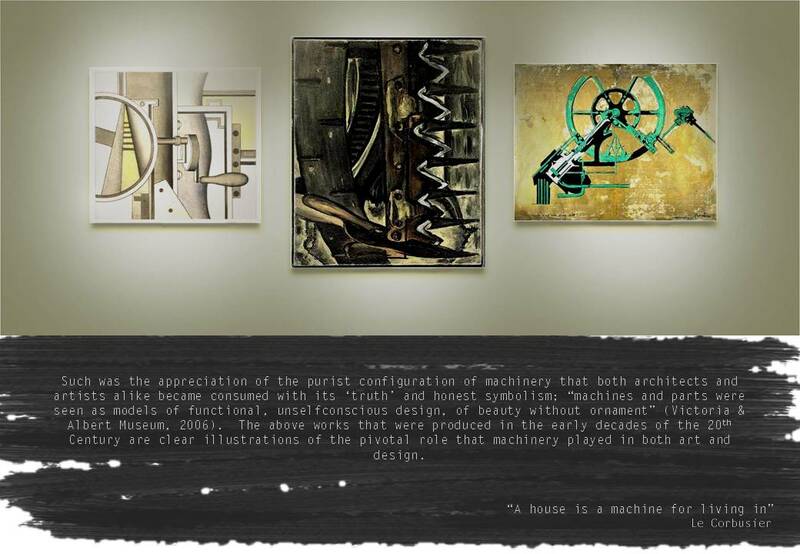 I understand that expressionism and abstract art had its part to play where Modernism was concerned but paintings of machinery? Really? Ok, ok on a deeper level the artists were acknowledging and celebrating the life changing effects of industrialisation and technological advancements during this time. The purist illustration of this would have been a painting of actual machine components. I think I’ve rationalised the paintings of machinery so much in this post that I no longer have a reason to question the significance of painting machine components and have now rendered this post useless. So (my new) point is; if you’re a fan of architecture, art or design take a little time to read up on the subject. You’ll be amazed at how the designs of today have usually, in some form, taken inspiration from the past.